Polyethylene chemical storage tanks are made of a flexible membrane. While they are durable and rigid, they also expand and contract with seasonal temperature variations, pressure changes from loading and unloading the tank, and vibrations from pumps during filling and discharge. Rigid plumbing connections put the tank and fittings at risk of damage, which can cause leaks. You can mitigate this risk in polyethylene chemical storage tanks by installing flexible connections. Reliably knowing the level of the liquid in your chemical storage tank is critical to maintaining your operations without interruption. Not only is the level an indicator for ordering more chemical, but certain chemicals have to be stored at a specific level to maintain their properties or operational requirements. A level gauge monitors the liquid level of the chemical you’re storing in your polyethylene tank. There are several types of gauges, including clear tube level gauges and ultrasonic level gauges. While Poly Processing can provide a variety of level indicators, we almost always recommend our reverse float gauge. Can I Use Handrails with a Polyethylene Tank? Various types of chemical storage systems have handrails along the top of the tank, but Poly Processing tanks don’t. Polyethylene tanks can’t support handrails, and the tanks shouldn’t be walked on. The domed surface can be very slippery, and the plastic can become brittle over time and possibly crack under a person’s weight. So how do you safely inspect manways, check gauges, and service level sensors or mixers? What Should You Do If Your Storage Tank Fittings Are Leaking? A leaky fitting is a serious issue that could put your employees in danger and cause damage to surrounding equipment. Leaked chemicals are a financial loss, and they can create serious environmental issues that plague your company for decades. Our field service team will occasionally receive calls from concerned customers who need help fixing a leaking fitting on their chemical storage tank. It's not an issue that comes up often so many people are not sure what caused the issue or what to do next. If you're storing chemicals that emit fumes such as hydrochloric acid or hydrogen peroxide, you need to have a proper venting system in place. We've developed The PolyScrub™ fume scrubber to help you ensure the safety of your employees, equipment, and the environment. We have all heard the adage, “if a job is worth doing, it’s worth doing right”. Poly Processing believes this to be true 110% of the time when it comes to containment. Every single piece of a tank system needs to be completely secure to protect your workspace, your employees, the environment and the chemical being stored. Thus, when you install a tank-within-tank system like the SAFE-Tank with a sidewall fitting, it is critical to also install a bellows transition fitting. 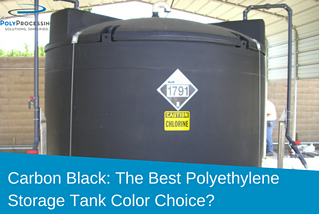 A wide variety of colors are available for polyethylene storage tanks. Cosmetics to match the surrounding buildings and landscape, customer preferences, and the application or the chemicals being stored are factors determining tank color selection. However, one color which is almost always selected for higher end storage solutions, such as storing harsh, aggressive chemicals such as sodium hypochlorite, is black. Are Bolted Side Manways Safe for Chemical Storage? There is more than a tank to think about when configuring a polyethylene chemical storage system. As always, you have to think about your chemical first, then you have to choose the tank most appropriate for that chemical, then you need to choose the fittings and accessories that will ensure that your tank system is safe and effective. Another key consideration is the actual access point to the inside of the polyethylene tank. There are various points at which you can access the tank: from the top, or dome, and from the side. Each of these tank entrances must be protected with a manway cover to protect both the chemical itself and the surrounding environment and employees. Two of the most important factors in the design of any chemical tank storage system are the way the system is vented and whether or not the system requires flexible connections. Proper venting ensures correct atmospheric-only pressurization of the tank, which can prolong the life of the tank. The placement of appropriate flexible connectors will not only help ensure a tank’s longevity, but can also protect the tank from hinge points that can cause dangerous leaks. If you’re installing a sidewall fitting on a chemical storage tank, you’re actually creating new opportunities for leaks and chemical attack. Every hole drilled into a tank’s wall can become a weak point in your tank. You can prevent a breach in your tank’s system by carefully selecting your fittings.